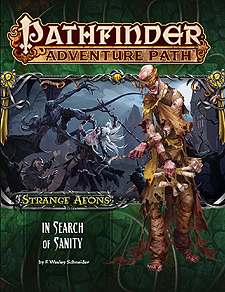 "In Search of Sanity," a Pathfinder adventure for 1st-level characters, by F. Wesley Schneider. A double-sized article that peers into the dangerous realm of the Great Old Ones and Outer Gods who make up the Elder Mythos, by James Jacobs. A dollmaker's macabre secret in the Pathfinder's Journal, by Jason Keeley. A collection of weird and frightful new monsters, by Eric Hindley, James Jacobs, Jenny Jarzabski, and F. Wesley Schneider.